“The news received regarding the massive budget shortfall was tragic. The governor and legislature have gone so crazy with tax giveaways that they are jeopardizing Oklahoma’s future just to cater to a few huge corporate special interest campaign supporters. “The required cuts for the remainder of this fiscal year, along with the estimated $900.8 million fewer dollars the state will have to appropriate next year should be no surprise to anyone. This follows the $611 million reduction last year and the $188 million shortfall from the prior year. This crisis ties in with the implemented tax cuts which reduced collections even further. “We should not forget there is another income tax cut on the books which will set essential services back even more once signs of improvement are seen. Action needs to be taken this session to restore the fiscal responsibility we have not seen in recent years from our elected officials. I’ll just leave that there. I’ve probably already said enough this week. It’s Election Day. Go vote! Vote for Joe! Vote for Joe! Vote for Joe! And the people will regain control. So get up, get out, get going. For one of the few times that I can recall, the editorialists at the Oklahoman and I are on the same page. Today, they listed all the people we should vote for on Tuesday. In the case of their endorsement of Governor Fallin, I disagree. In fact, I disagree with quite a few of their choices. One paragraph, however, caught my eye. Democrat John Cox faces Republican Joy Hofmeister. Cox is the longtime superintendent of Peggs Public Schools. Hofmeister owned a private tutoring service and briefly served on the state Board of Education. The Oklahoman makes no recommendation in this race. This is only a hunch, but I do believe they’re still sore that their horse came in dead last in the June primary. Go figure. As for me, I too will make no endorsement – probably for different reasons. I like both candidates – one more than the other. I also have concerns with each, though nothing that I would consider a deal breaker. If my choice doesn’t win Tuesday, I can cheerfully support the candidate who does. What I can’t support is the divisions that have surfaced recently among educators and education voters during the last few weeks. What Cox and Hofmeister have done this fall – traveling the state and making numerous appearances together – is incredible. Governor Fallin only debated Joe Dorman once. Some candidates for statewide office have avoided their opponents completely. There are differences, and they are significant. Two people whose writing I enjoy reading are Rob Miller and Marisa Dye. Both have insight regarding public education. Both have endorsed candidates for state superintendent this weekend. Yesterday, Dye endorsed Cox. Today, Miller endorsed Hofmeister. Each has sound reasons that work for them. Both have done their homework. Neither wrote their endorsements while vilifying the other candidate. The fact is that we’re all people concerned about reversing the political climate that attacks public education. We all have different triggers that make us mark our ballots for whomever we choose. Unfortunately, I’ve seen too much of the negative turn lately, and it falls along predictable divides: large schools vs. small schools; rural vs. suburban; Republican vs. Democrat. Sometimes these differences matter, but in this race, they shouldn’t. Unlike Janet Barresi and Mary Fallin, neither candidate has done a thing to hurt public education. I’ve even seen the campaigning turn negative, which is bound to happen in a tight statewide race. To be honest, it hasn’t been as ugly as the primaries, which is a good thing. When the votes are counted Tuesday night, we will have chosen a new state superintendent. Hopefully, we will have chosen a new governor too, but I’ve already put my chips down on that race. Joy can do this job, and so can John. Whoever wins, we will have an effective advocate for funding and common sense when it comes to school regulations. Both would face significant obstacles, though. As Brett Dickerson points out today, there will be forces trying to wrest control over policy decisions away from the new state superintendent. If we want effective public and publicly-controlled schools in Oklahoma we will have to step up and aggressively defend the position of Superintendent of Public Instruction, no matter who wins, Democrat John Cox or Republican Joy Hofmeister. Why? Won’t it be enough to just move Barresi out? Sorry, no. If the forces in power – whether they are all Republicans or a mixture of both parties – want to mute us, they will start by marginalizing the office that Cox and Hofmeister seek. Then they will build upon the divisions that have surfaced during the campaign. Get the urban/suburban schools going in one direction and the rural schools going in another. Push consolidation to the constituency that wants it and drive into the rural communities saying you’ll block it. Meanwhile, we’ll be griping about federal intrusion into our schools in spite of the burdensome regulations the state has given us. Vote your heart on Tuesday – even if it’s taking you in a different direction than mine. Then, we need to come together, unite, and fight for public education. June 24 was step one. November 4 is step two. After that, we still have to endure the legislative shenanigans of people who work from February through May and think they know our jobs better than we do. For that, we’ll need to stick together. We are a week away from Election Day, and I’m ready for the campaigning to be finished. This is the time when close races between fundamentally good people devolve into nasty accusations and contorted truths. I’m a fan of neither of these practices. They don’t influence me in a positive way. How I will cast my vote for governor probably comes as a surprise to no one. 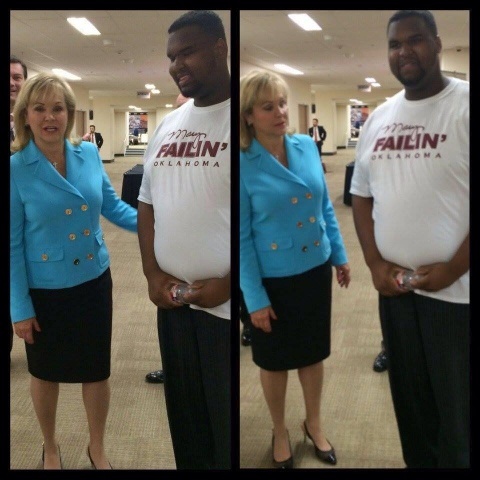 If you’ve followed this blog at all, you know that I don’t think Mary Fallin has been good for public education. You also should know that I’m not a single-issue voter or a straight-party voter. If I agreed with Fallin on every single issue outside of how she’s treated schools, I would have to consider supporting her. Well I don’t support her, and truthfully, I decided that long ago – probably about the time she vetoed HB 2625, which allowed for parental input into the third-grade retention decision. In fact, she didn’t just veto the bill; she delayed sending official notification of her decision to the Legislature in an effort to out-maneuver them. In other words, she wanted the win so badly that she thought cheap stunts would circumvent the will of the people. In the end, a combined vote of 124-19. Neither chamber debated the decision. They simply took the veto notice and voted it away in a matter of minutes. This is not a contorted truth. This is a documented accounting of how events unfolded. Similarly, in June, Fallin waited until the last possible minute before deciding to sign HB 3399, which overturned the Common Core State Standards and brought back PASS as the state’s reading and math standards. Since she was one of the main reasons Oklahoma adopted the CCSS, the decision surprised me. As recently as January, she was still defending CCSS to the rest of the country’s governors. It was also the first indication I had that her campaign viewed Joe Dorman as a legitimate threat to unseat her. It was also at this point that I began researching whether my decision would be a vote against Fallin or a vote for Dorman. It will be both of these things. Below, I will explain why. Since the start of the recession in 2008, states have struggled to fund all basic services. Most have begun restoring funding to public education. Unfortunately, a recent study showed that per pupil funding in Oklahoma is still 23 percent below the 2008 level. This represents the worst loss of education funding in the country. As much as the State Board of Education wants to give teachers a substantial raise, it’s not up to them. We need a governor who will work with the Legislature to make this happen. Joe Dorman’s “Classrooms First” plan dedicates 100% of funds from the existing Franchise Tax to in-classroom instruction and prohibits using these resources in the general fund for any other purpose. These funds will not be subject to political games and special interest giveaways and subsidies. This plan does not raise taxes one dime, and it stops the political sleight-of-hand the politicians use to cut school funds. This plan ties the state legislature’s hands from playing politics, arbitrarily cutting our public schools’ funding and harming our kids and our economy. This is good for parents and kids, good for our business community and economy, and is a fiscally sound policy for our state. Fallin’s main emphasis during her term has been cutting taxes. Unfortunately, most of those cuts are corporate and geared at the energy industry. While there’s no doubt that this state is reliant on the oil, gas, and electricity producers, there is a middle ground in which we can support basic governmental services like schools and roads without biting the hand that feeds us. Also, Fallin’s proposal to cut income taxes would impact most Oklahomans by dozens of dollars a year. This doesn’t change the lives of the working class, but it does contribute to the decline in support of schools. When we say that schools have lost funding, we should be specific about the fact that that loss squarely falls upon the state. As the table below illustrates, Oklahoma has seen a gradual decline over the last 15 years of support from the state, coupled with increased reliance on support from the federal government and local revenue. It is appropriate to discuss 2008 as a reference point because that’s the generally agreed upon date of the recession. As you can see, since that time, the percent of district budgets supplied by the state has fallen by 5.3% since that time. I threw two more points of reference into the table as well. First is 2004, since that’s the last year Democrats controlled the Legislature. As you can see, the state and local shares of school funding stayed pretty constant for the first four years that Republicans were in charge. Going back five more years, to 1999, we can see that the percentage of school funding from the state used to be even higher. That changed after President Bush and Congress passed NCLB in 2001. With extra funding from the feds came extra regulations and controls. Conversely, school districts in Oklahoma now face an increasingly burdensome regulatory morass from the state, even though the state picks up far less of the bill than it used to. Keep this in mind the next time you hear teachers and administrators talk about the loss of local control during the last four years. This happened on Fallin’s watch. The recession that began two years before she took office gets some of the blame – the funding part at least. The regulatory burden schools face now falls squarely on Fallin and outgoing State Superintendent Janet Barresi. No child should ever fail to get a world-class education because our policymakers believe success is too difficult. First, we must continue to improve K-12 public school results. We know that we are graduating high school seniors who aren’t ready for the workforce or college. That has to change. Second, we have to increase the number of Oklahomans who continue their education beyond high school, either by attending college or a career technology center. A high school diploma is not enough. We are taking active steps to address this crisis; and it is essential we continue to move forward. For instance, too often, we set up children for failure by sending them on to higher grades without the reading skills they need. We’ve changed course – by requiring that third graders learn to read before moving on to the fourth grade. We’ve also implemented the A-F grading system that lets parents, students, teachers and administrators know how their school is performing. In 2010, the Legislature voted to adopt new, higher standards in English and math, and those new Oklahoma standards will be fully implemented this year. The new standards focus on critical thinking – the kind of skills our children need to get a job or to succeed in higher levels of education. While we are raising standards, we aren’t telling teachers how to teach that lesson or what books to use. Those are decisions that will always be made locally. And here’s the pay-off: we will start graduating seniors that are truly ready for the workforce AND for college or a career technology education. Because I don’t like to take things out of context, but I also don’t like 3,000 word blog posts, you should probably go back and read the entire speech. This was when Fallin wasn’t in campaign mode and she was expecting to coast to an easy victory. What she believes is clear. We need more testing and we need the Common Core. Without these in place, schools will continue doing their own things, and we just can’t have that. A Blue Ribbon Commission consisting of teachers, parents, principals, superintendents, school board members and Oklahoma education college professors will work to set new education standards. The Commission will represent Oklahoma’s different schools, regions and communities. Gifted students, special needs students, and students requiring remediation will receive assistance. Once the standards are written, the Blue Ribbon Commission will hold town halls and forums across the state to hear input from citizens on the standards. The input will be used to refine and finalize the new standards. The Blue Ribbon Commission will continue to meet annually to assess the standards and make any changes as needed. A Superintendents Advisory Board will implement the new educational policy and develop the best ways to implement policy in individual school districts while maintaining local control. The Governor will host an annual student forum consisting of high school sophomores and juniors from across the state to discuss how to improve education, how to make them more college and job ready and how to improve standards to make them more ACT ready. He also proposes scrapping the current testing system for the ACT and its cycle of tests that are developmentally tiered for 3rd through 12th graders. While I would just like to see state testing go away, I know that’s not realistic. Instead of giving students a battery of exams that have little meaning to them and none whatsoever to those in higher education, we would be better off using exams from a national college testing company. Are the questions written to the Oklahoma standards? No, and frankly, I don’t care. Do they include science and social studies content? No, and the colleges who look at ACT scores don’t care. While a lot of the frustrated educators around the state disagree with me on some of this point, I hope they will at least consider the futility of the current testing system and the fact that it has had more than its share of unintended consequences. Dorman seems to get his ideas on education from the people working in and attending our state’s public schools. He even hangs out with teachers. 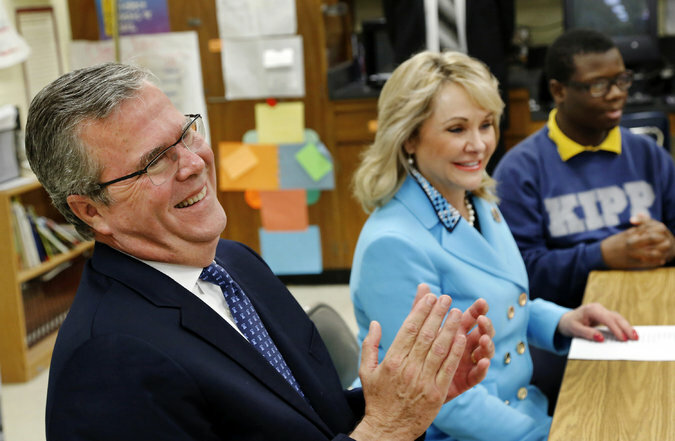 Mary Fallin, when showing education reform guru Jeb Bush around Oklahoma chose a charter school to visit. It wasn’t just any charter school, either; it was KIPP – which is a franchise of a national chain of charters. It’s like inviting another state’s former governor to Oklahoma City for a steak and taking him to Outback instead of Cattleman’s. For all of KIPP’s accomplishments, keep in mind that they play by a different set of rules. Oklahoma teachers voted to change the leadership in education last July. Voting Barresi out was the only smart decision they could make. Below, I have compiled average teacher salaries from before the recession to now. As you can see, teacher salary – including fringe (insurance, retirement) – has changed very little in this time. I added the Experience column because I was curious if we had more veteran teachers retiring, which would account for some of the stagnation. That really isn’t happening. Meanwhile, when you look at insurance costs, you see that teachers are bringing home less now than they were six years ago. While average compensation has grown by $843, the cost of Healthchoice has increased by $1,197 per year. If teachers have a spouse and children on their insurance plans, it’s even worse. And before we get all worked up about Obamacare, remember that the increase from 2008 to 2009 is higher than all other years combined. For all the inherent rewards of teaching, the pay just isn’t there. In fact, it’s less than it was just a few years ago – significantly less. And this happened on Mary Fallin’s watch, while she continued with her tax cuts that neither stimulated the economy nor benefitted average working families. Fallin’s aid told her that he didn’t think she “wanted to take a picture with a Mary Failing t-shirt.” She then looked at my shirt and said, “You’re being mean to me!” Her staff started rushing her through the stairway completely bypassing the elevator and she said, “I just assume everyone is going to be nice.” A man from her campaign followed my group to the elevator, took our pictures, and said, “We’ll be seeing you soon.” I laughed and proceeded to get on the elevator! Well, governor, not everybody is going to be nice. On some level, you must understand this. Otherwise you would have debated your opponent more than once. I personally know a lot of teachers in this state who don’t feel you’ve been very nice to them. They would probably adopt the respect the office in spite of its occupant approach – as many Oklahomans also do with the President. One of my favorite ads that currently runs is the Geico ad wherein the teenagers scurry to hide from an axe murderer and make a lot of poor decisions. I’m not saying that educators voting for Mary Fallin would be as stupid as teens hiding behind the chainsaws. It wouldn’t even be as stupid as voting for Janet Barresi. It would just be self-defeating. A vote for Joe Dorman, on the other hand, is a vote for better working conditions, competitive salaries, and restoring education that is geared towards our students rather than the publishers and testing companies that are bleeding us dry. Be informed, and vote wisely.